What does your forecast show? – We try to give as much information as possible, but only where it is statistically significant. We try to show a 50% confidence interval on the national and regional vote share for the major parties and the range of likely seat possibilites. In doing the latter we show a much narrower range of possible seats for each party than some other forecasts as we believe a wide range of seats, for example the wide range used in the YouGov model, makes the concept of a “prediction” almost meaningless. The range of seats we indicate is the narrowest one which we believe is possible to offer and is based on the mid-point of our forecast. It is the “most likely” outcome but we accept that it does not cover all possibilities. The overall summary of our forecast is “Modest Gains for the Conservatives”. Our forecast today shows a slight decline for the Conservatives on yesterday, though we continue to confirm an overall trend towards the Conservatives over the past few days. Our forecast began to move towards the Conservatives after the weekend’s polling. 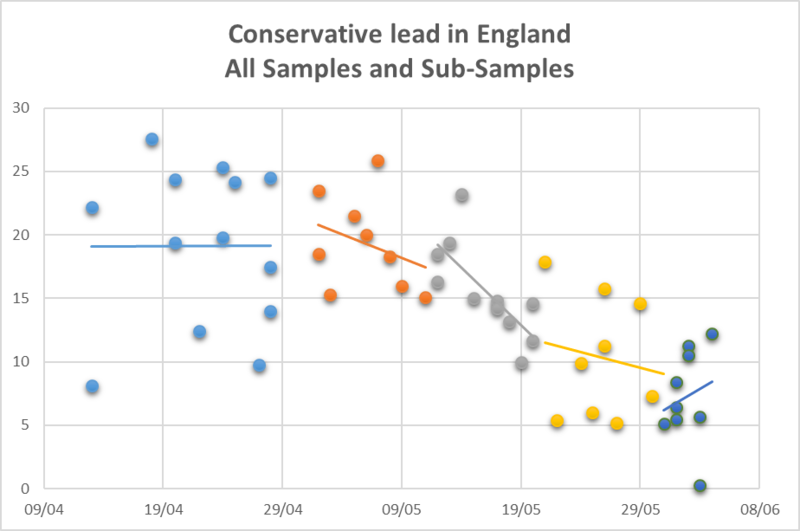 We continue to examine the issues around turnout weighting and note with interest that the two companies with the most sophisticated turnout models, ComRes and ICM, have not only produced the largest Conservative leads but are also clustered together in their results. Our Scottish and Welsh forecasts now have expected vote ranges in each of the regions. We continue to see evidence that all three national parties will make gains from the SNP on Thursday in Scotland. Our Welsh forecast (as indicated by the large vote ranges displayed) has a high degree of uncertainty in it and we are cautious as to the actual result. This caution and uncertainty is driven by the one recent large survey (YouGov) being contradicted by national poll subsamples. Where (as in Scotland) we rely on a number of large samples alongside sub-samples, the range of uncertainty is much narrower). We explore the probability of the Conservatives and Labour beating each other for vote share in Wales (for first place) and Scotland (for second place). Both probabilities show an absolute neck and neck race.